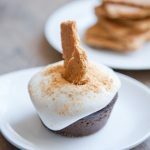 It’s hard to believe, but this will be my last recipe post for the year! I’m still a little in denial that we’re a week away from Christmas…how did that happen so quickly?? It only seems fitting to end on a sweet and dark chocolate note. 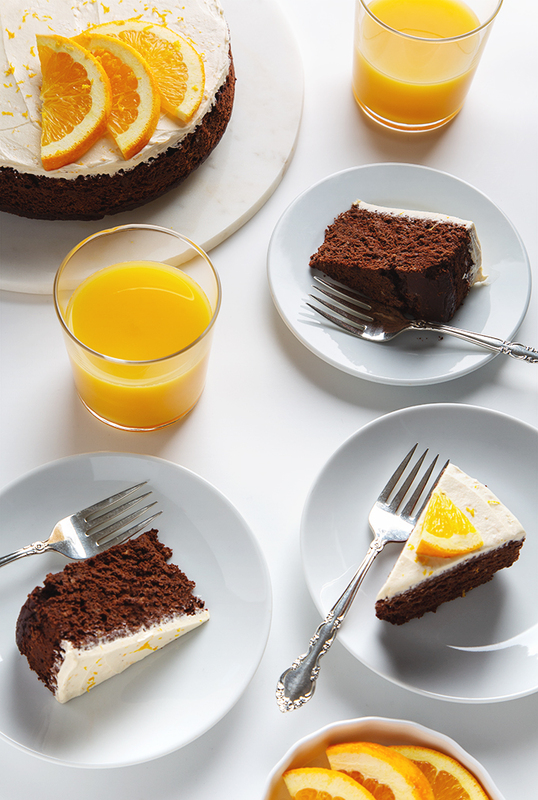 😉 Hopefully you’re not totally sick of desserts yet, because this vegan orange chocolate cake is so easy (10 basic ingredients! one mixing bowl!) 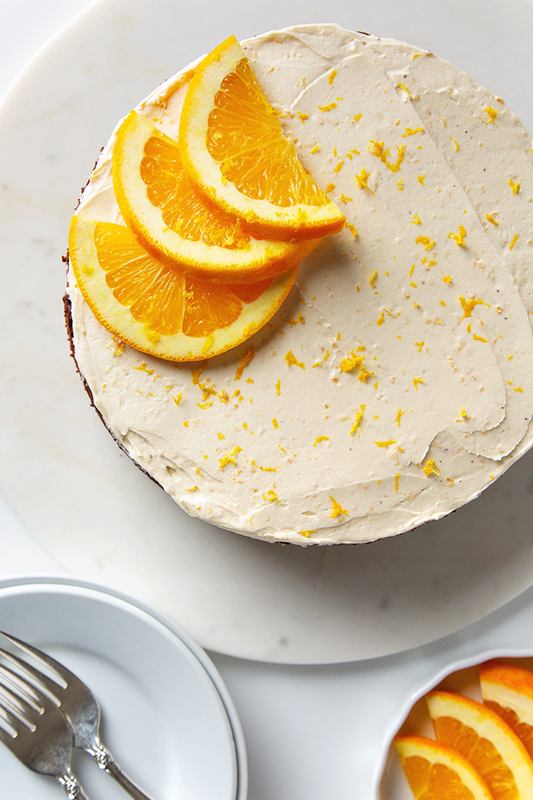 that it’s basically fool-proof, plus it’s frosted with a fluffy, orange-scented buttercream frosting. 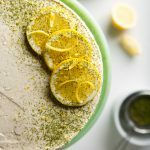 10-ingredient vegan orange chocolate cake with a simple and fluffy orange-scented buttercream frosting. This is a super easy recipe— just 1 mixing bowl and under 20 minutes of active prep work! Make the cake: Preheat the oven to 350 degrees F. Lightly grease an 8-inch cake pan with avocado oil and set it aside. In a large mixing bowl, whisk together the orange juice, orange zest, yogurt, coconut sugar, avocado oil, and vanilla. 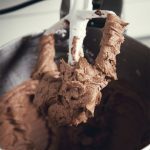 Using a wooden spoon or the paddle attachment on a stand mixer, slowly stir in the flour, cacao powder, baking soda, and salt. Mix until just combined—be careful not to over-mix. The batter will be thick. Using a spatula, transfer the batter to the prepared cake pan and smooth out the top into an even layer. Bake for 35-40 minutes, or until a toothpick inserted in the center comes out clean. Remove the cake from the oven and allow it to cool to room temperature. 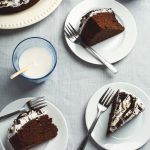 Once cooled, remove the cake from the pan: put a large plate over the top of the pan, flip it upside down, and tap the pan to release the cake onto the plate. Place the cake in the fridge to chill for 20 minutes. Meanwhile, make the frosting: In the bowl of a stand mixer (or in a large mixing bowl), cream the butter until it's light and fluffy (about 20 seconds). Slowly mix in the powdered sugar on low speed. Once all of the sugar has been added, turn the mixer to medium-high speed and continue to mix for 1 minute. Stop the mixer and add in the orange zest, vanilla, and salt (if using). Mix on medium-high speed for 10 more seconds, until the frosting is fluffy. 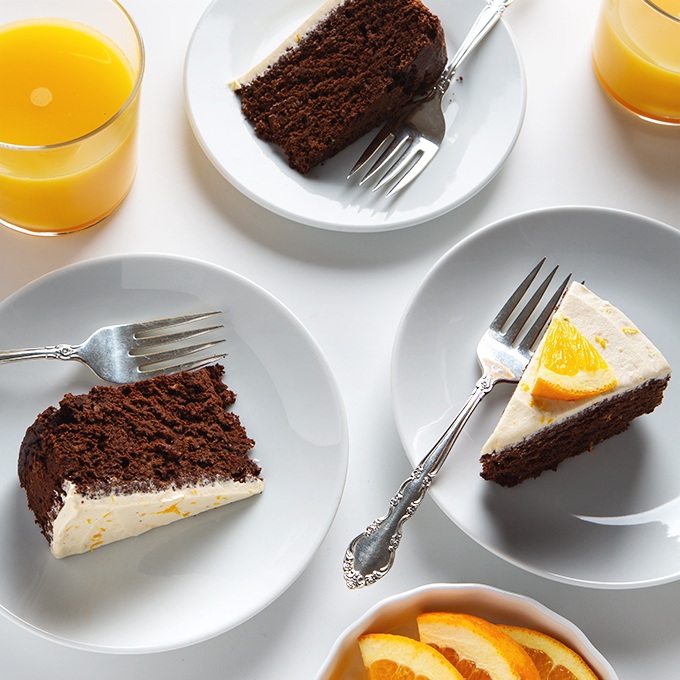 Spread a layer of frosting on the top of the cake (and all around the sides, if you'd like). 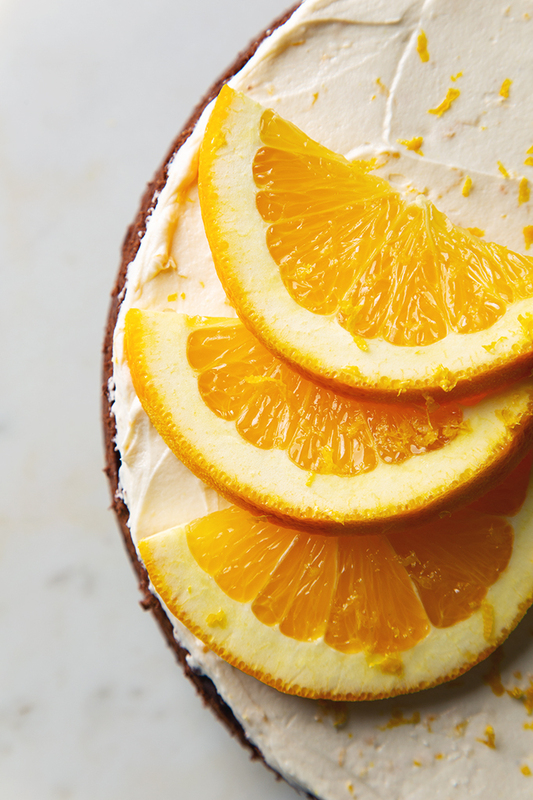 Decorate with orange slices and orange zest. If you don't have avocado oil, you can replace it with melted (but not hot) coconut oil. If you find that the frosting is too soft after you mix it, pop it in the fridge for 5 minutes to firm up. The cake can be frosted in advance and stored in the fridge. Leftover cake should be covered and refrigerated. Cake adapted from my Vegan Oreo Chocolate Cake recipe. This reminds me of those chocolate orange candies that you smash into segments. I haven’t had one in a long time but your post took me right back. Orange and chocolate is a great combo and I bet wonderful in cake form! Yes! It’s been forever since I had one of those chocolate oranges! Fun! Yes, you can definitely double the frosting. I often do twice as much because I also love the frosting, so that should be perfect. This is the best chocolate cake I’ve made to date, vegan or not. I hate to use this word, but it’s so moist! 😉 I had to freeze the leftovers to keep myself from devouring it all. Thank you! What can I use if I don’t have coconut oil or avocado oil? Canola oil? Thanks.